If you’re looking for simple, classic and easy, then look no further than our new Dixon range of Market Umbrellas! Dixon is a fantastic choice for the beach house, stored in the car for picnics away, or as a fixture in your outdoor table! Start the summer off right with a Dixon Market Olefin Square Umbrella, shown here in chic white! These umbrellas assist in making your outdoor area a lovely, pleasant experience with the option of shading from the hot sun! Try on of these stylish outdoor umbrellas over the top of your deep seating furniture, for hours of lounging and relaxation. The umbrella base is not included in the price. 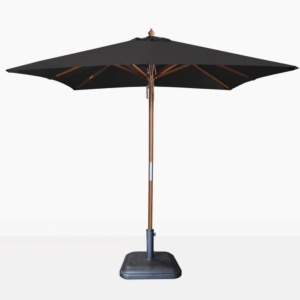 If you have a café courtyard, several of these gorgeous square umbrellas over your outdoor tables will provide your customers with comfort and care as they bask in the glory of the surroundings you have created for them. The Dixon Olefin Umbrellas are a great choice for by the poolside, so you can sun bathe without sun-baking! The Dixon Market Umbrellas are available in two colours and in round as well as square. 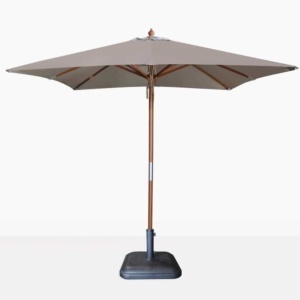 Take advantage of this gorgeous classic umbrella style, with a wooden frame, pulley system and new Olefin fabric. Olefin is a fantastic material is solution dued, meaning it is less likely to fade, it also resists mould and mildew and has a UV deterant within the fabric, meaning that you will be well protected from the suns harsh rays. At Design Warehouse, we care about making your outdoor area your favourite liveable space! Everything we do is about stylish, luxurious, relaxing comfort. From our deep seating to dining, to relaxing to pool side furniture, we use the best materials and have the largest range of options in this hemisphere! Design Warehouse is proud to carry an amazing array of outdoor umbrellas, including the new Dixon range, available in 2 colours and sizes. Call us today to secure your brolly!